MADISON HEIGHTS, MI, November 16, 2018 – Xeeva, Inc., a global provider of AI-powered procurement and sourcing software, announced today that it won the runner-up award for “Outstanding Solution Provider” at the 2018 ISM CPO Forum Awards in India for the second year in a row. Focused on recognizing procurement excellence, this was the sixth annual CPO Forum Awards held by ISM. This year’s two-day conference, held in Mumbai, had the theme of the digital transformation of procurement. The outstanding solution provider category recognized organizations that deliver high-quality customer service and improve performance, efficiency, and productivity. The judging panel made their selections based on criteria, including involvement of staff, use of best practices, and value delivered. Xeeva was awarded by the panelists for its patented AI technology, in-depth procurement experience in the domain, and ability to solve problems relating to spend visibility and sourcing savings. 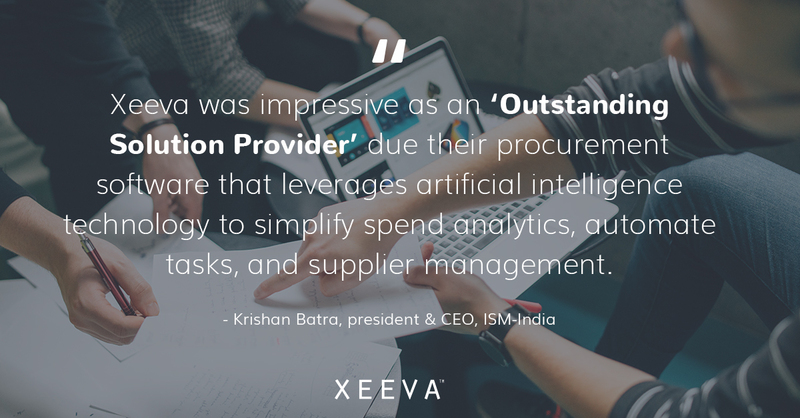 “Xeeva was impressive as an ‘Outstanding Solution Provider’ due their procurement software that leverages artificial intelligence technology to simplify spend analytics, automate tasks, and supplier management,” stated Krishan Batra, president and CEO of ISM-India. To learn more about Xeeva’s innovative AI-powered procurement software, click here.